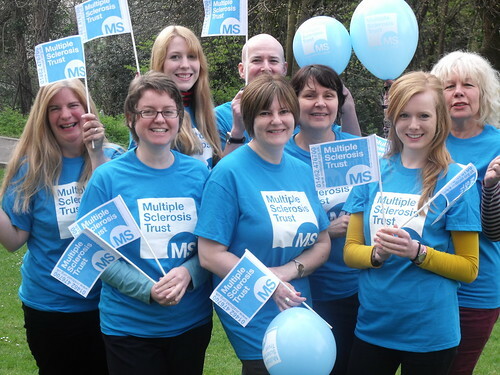 Although Friday is the end of the working week, MS Awareness Week continues right through to Sunday 5 May – and Bold In Blue events will continue right through the month and beyond. So there is still plenty of time to to get involved and make a difference! It can be as simple as wearing a blue wristband to show your support. Or you could hold a Bold In Blue event like many of our supporters. If you haven’t planned anything yet don’t worry, you can always help by organising something later in the year – find out how you can Be Bold in Blue. We’ve received word of hundreds of Bold In Blue events taking place around the country this week. 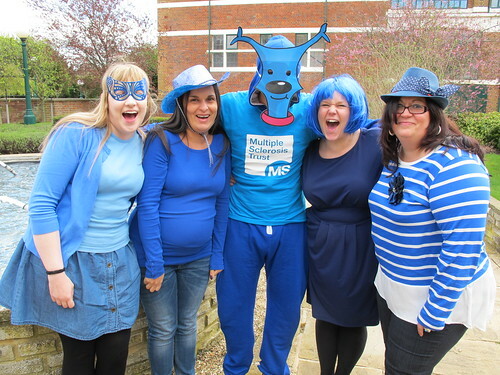 Here at the MS Trust’s offices in Letchworth Garden City we kicked off the week with a Bold In Blue lunch featuring a very special guest appearance from our fundraising mascot, Bob! 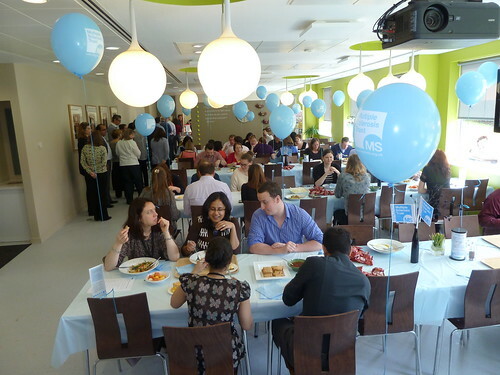 Staff at Biogen Idec’s offices in Maidenhead have been holding Bold in Blue events all week. 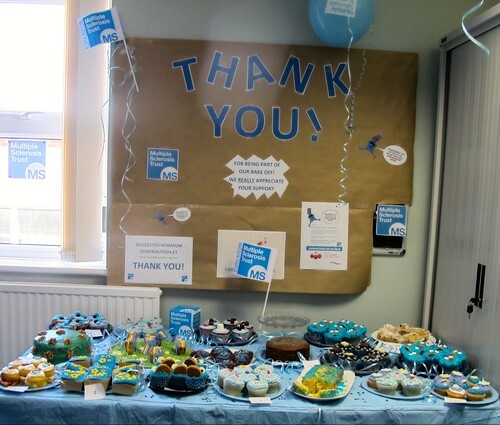 The Information for Families team at East Sussex County Council in Lewes held a BBIB day and raised over £800 by selling cakes, a raffle and dressing blue. 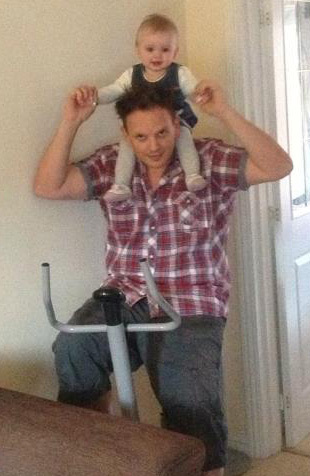 MS Trust supporter Chris Wilkinson from Attleborough in Norfolk held a static bike ride and has raised almost £1,000. The team at Spirax Sarco in Cheltenham held a Bold In Blue baking competition and raised over £140. 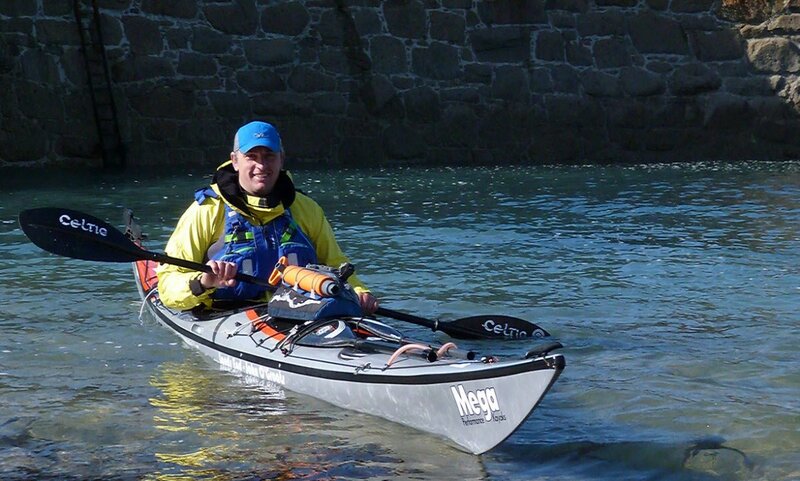 Meanwhile Glyn Brackenbury has embarked on a epic kayaking journey from Lands End to John O’Groats! He’s currently at Anglesey – you can follow his progress at his blog. So far this our Bold in Blue fundraisers have raised over £5,000, and, with lots more events planned for this weekend, there is even more to come! All funds this year go towards the MS Trust’s nurse support programme, in particular our campaign to help roll out the tools we developed on our pilot programme, helping nurses generate evidence for the impact of their services. 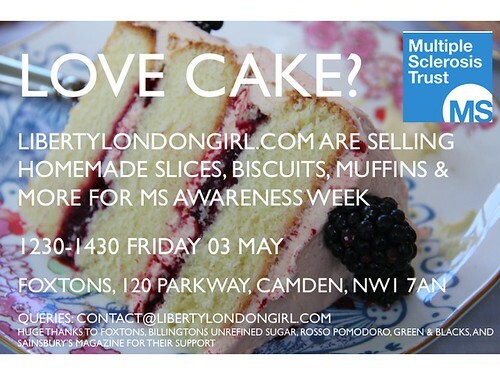 To read more about our work safeguarding the future of MS nurses, and to find out how you can help read our blog post.